robot. 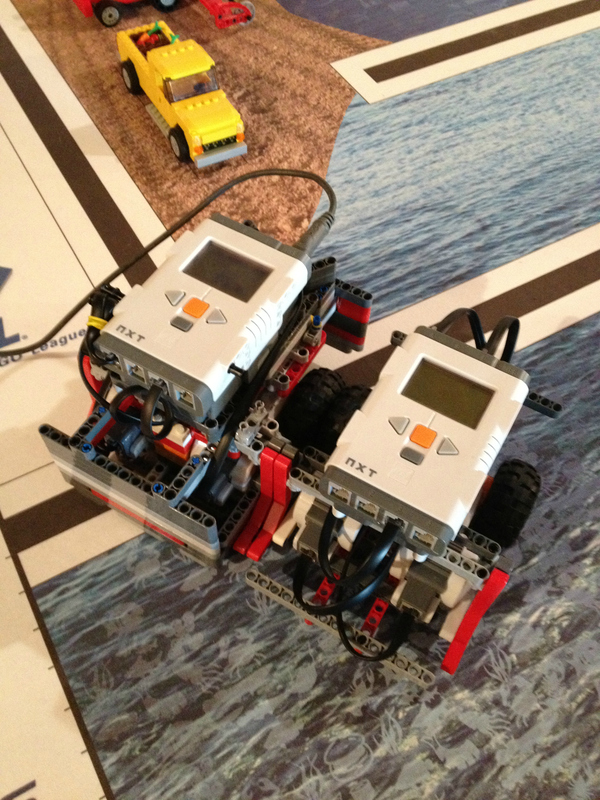 When the robot moves forward, it either pushes or pulls the attachment in that direction. up, sweep the old attachments out of the way, and set the robot back on the new attachments. the board and complete missions, earning us more points! You can see this in action at our Facebook page, where we have a few videos of the reliably working robot runs. 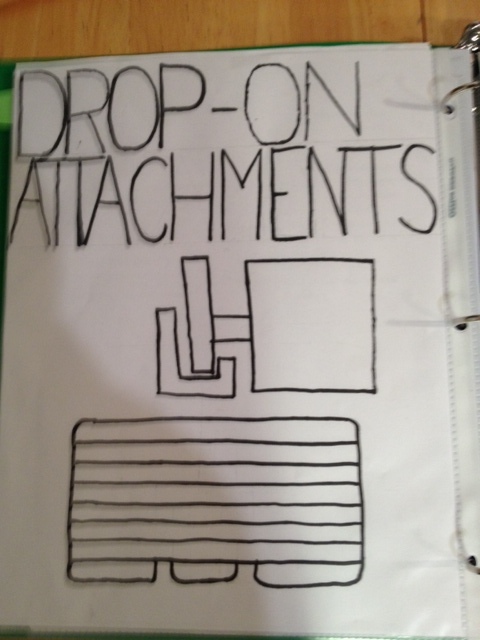 Thanks to Julia for drawing this picture for our "inconspicuous green binder"! 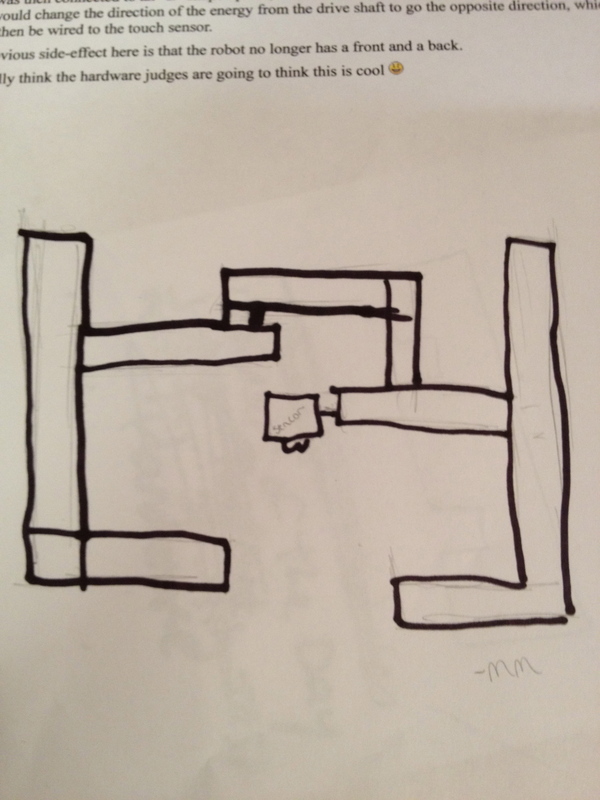 While brainstorming cool hardware ideas, someone mentioned a concept of two bumpers (one in front and one in back) that would both be connected to a single touch sensor. I was dubious at first, but immediately set to work on the idea. 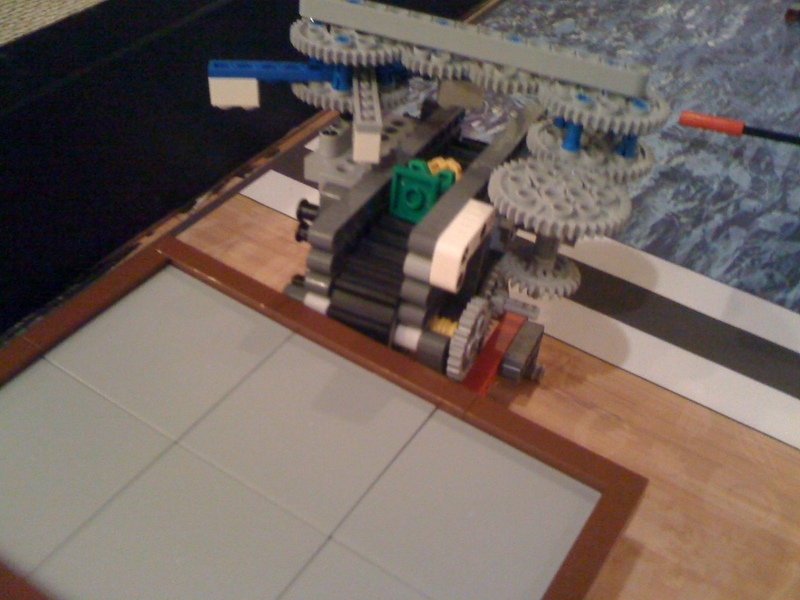 After we had a functioning base to build off of, I started by first building just your standard, everyday bumper mounted in the front of the robot, connected directly to the sensor. I then went on to create a second bumper as if there was a sensor there. 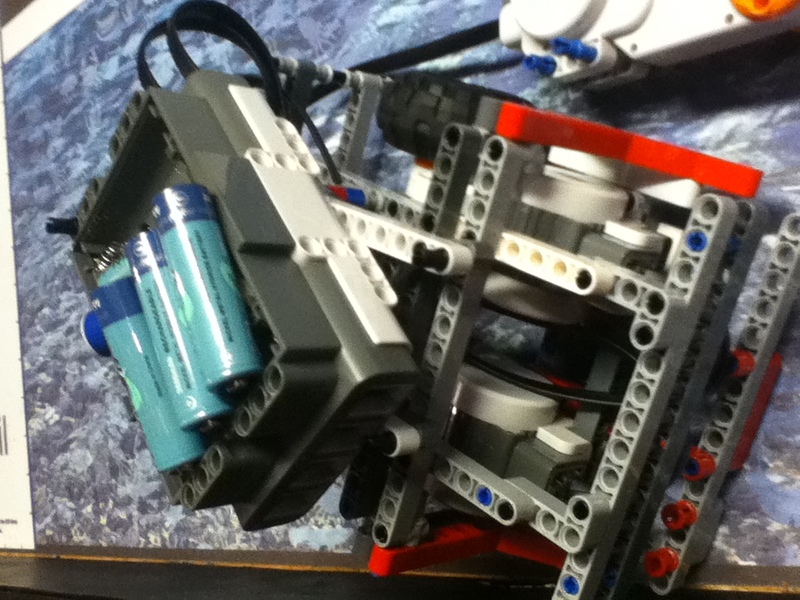 In place of the sensor, I mounted a rod, which could travel through the length of the robot similar to a drive shaft. The shaft was then connected to an “L” shaped piece, mounted so that it would pivot around the middle. This would change the direction of the energy from the drive shaft to go the opposite direction, which could then be wired to the touch sensor. The obvious side-effect here is that the robot no longer has a front and a back. While testing a calibration program, we noticed something wrong with one of our robots – the light sensor values returned were different from different “bricks” (that is what we call our NXTs). The calibration program would only work as we expected it to on the main robot. On the main robot, the white-black range was 0-100. On the secondary robot the range was 37-64. Although this is not a showstopper right now, it is not what we want. We started troubleshooting. Our approach was to start with something we knew was true and then to make one change. This way we could find out what the problem was. The possible suspects were the ports, the wires, the light sensors, or the brick. After going through and checking every port, light sensor, and wire we owned, we realized that there was a problem with the NXT brick. Now we know that if we need consistent results, we should only use the main robot. Our secondary robot is now our mule. A mule is used for testing attachments, and not much else. While working on the grocery challenge (where you must deliver the groceries to the kitchen table in the middle of the board), the idea of a conveyor belt came up. They tasked me with the near impossible task of designing and building an attachment that will propel the bags of assorted goodies onto the miniature table. The result was a monstrous, crudely built, gear powered conveyer contraption with arms to smack the odd baguette back into line. The timing with the gear ratios is still a little bit off, but this prototype is the proof of concept for other gearing ideas I have wanted to toy around with for quite some time. I will post updates as I get them. Our team met today in order to organize and construct the different parts of our 2011 Food Factor challenge board. When completed, this board will offer a variety of challenges that our Mindstorm NXT robot will have to complete. Our kit arrived last week, and we are itching to start building it. 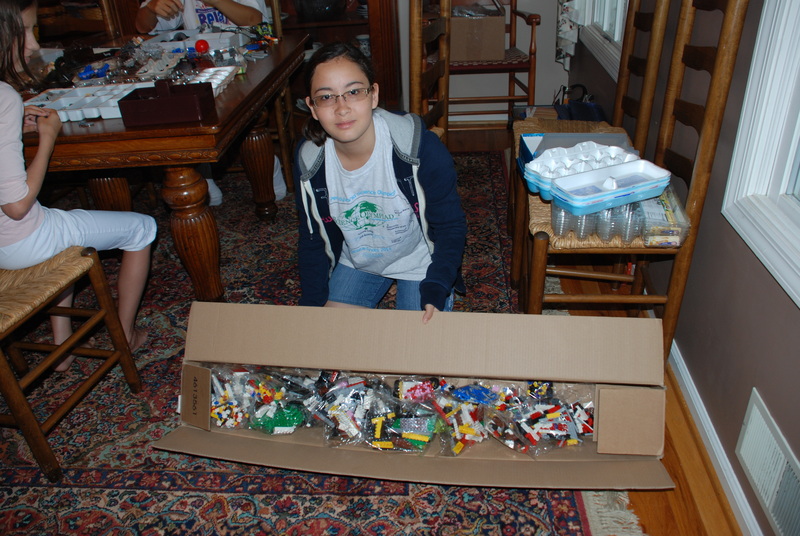 But first, we must organize our old robot. We used a LOT of egg cartons.